Steam Generator Tube Inspection - 20 Years Alstom Experience and now? LT using freon on the membranes of LNG carriers tanks. Since, SG tubes inspections has become one of ALSTOM NDT main activity. ALSTOM NDT has always worked to answer favorably EDF requirements, to reduce the inspection times while increasing the performances and the quality of results. After a quick statement of HBS's evolution, this document presents the development of ET and LT methods and systems implemented for the SG tubes inspection in France, during the last twenty years. The second part of this paper concerns the perspectives on a mid term basis. 1976 : HBS, Hotchkiss Brandt Sogeme, THOMSON group. 1983 : HBS, Subsidiary of CIT-ALCATEL, CGE group. 1986 : CGA-HBS, fusion between HBS and CGA-ALCATEL. 1989 : CGA, CGEE-ALSTHOM group. 1996 : CEGELEC, ALCATEL-ALSTHOM group. 1999 : ALSTOM Contracting Sector ISS / CND. As part of a Pre Service Inspection (PSI), ALSTOM NDT first intervention is the inspection using an axial probe (SAX) of the full length of the 9900 tubes of three 900 MWe SG. The acquisition rate is about 10 tubes per hour. The inspection requires 4 weeks. The probe is set manually in front of the tube to be inspected. The data acquisition system, set up in the Reactor Building close to the SG, is based on analogical components. Calibrated data are stored on magnetic tapes. Their main signal constituents are restored on strip chart. Data evaluation is made in two steps ; first of all, detection of indications from the strip chart, then direct classification or analysis in phase and amplitude of the signals on tape. Results are manually reported on preprinted forms ; the synthesis of results is finalized about 3 days after the end of the data acquisitions. ALSTOM works out the first SAX probe on 1300 MWe and concludes the first PSI. Transition from analogical to digitized signals. Data acquisition is carried out from outside of the Reactor Building. Raw data are digitized at the sampling frequency of 2 kHz at the output of the Eddy Current unit, forwarded by cable until the shelter, then stored on digital tapes. Data are calibrated by means of a digital signal analyser, then restored in analogic mode on strip chart recorder in parallel connection. Implementation of a « great analyst » as Supervisor, in charge of overseeing strip chart and checking analyzed data. First in service inspection after refueling shut down on a 900 MWe plant ; use of a finger-walker,remote controlled from the annular space of the Reactor Building. The strip chart reading and analysis data are conducted by one analyst at the same time ; two analysts in two shifts worked on each inspection line. First in service inspection after refueling shut down on a 1300 MWe plant ; use of a SMOR manipulator remote controlled from the shelter. First helium leak testing (LT) on a 900 MWe SG tube bundle inspecting 2 tubes simultaneously. This inspection phases is about 30 hours long. First ALSTOM inspection of hundred tubes with ET pancake coil (STL) in the roll transition at the top of the tubes sheet. A specific push-puller gives the movement of translation and rotation to the probe through a supple flexible hose. The step of the helical movement of the probe in the inspected zone is given by a screw-nut system. Evaluation of pancake coil data is done using the strip chart (detection, then position and length estimation of indications) and from the tapes (amplitude and phase of indications). The full evaluation of a tube with indications requires about 30 minutes ! First data storage on Numeric Optical Disc 12" (DON) according to a EDF data format specification ; this new support offers the sequential access to the data as well as a better life expectancy of information. Beginning of the data management on IBM AT & XT through a local area network. The characteristic values are input in the database as one goes along by the analysts. The synthesis of results is automatically printed out at the end of a control. First helium leak testing of a 1300 MWe SG tube bundle, inspecting 4 tubes simultaneously. EDF supplies ESTELLE, a software working on PC for the expertise of pancake coil data. The pancake coil strip chart is suppressed for the benefit of video display, calibrated and shaped signals. ESTELLE allows processing and analysis of quantity of tubes more and more important ; the data processing of one tube is less than 10 seconds long. EDF supplies SURCOUF, a software working on HP9000 UNIX. SURCOUF is an universal system to read the Eddy Current data, allowing quality check, processing and analysis of bobbin coil data stored on magnetic tapes or digital optical disk. ALSTOM develops GESSIE, a software for the automatic data management of results produced by ESTELLE and working on a local area network. In partnership with EDF, ALSTOM performs two tests in real site configuration with STACOUF. 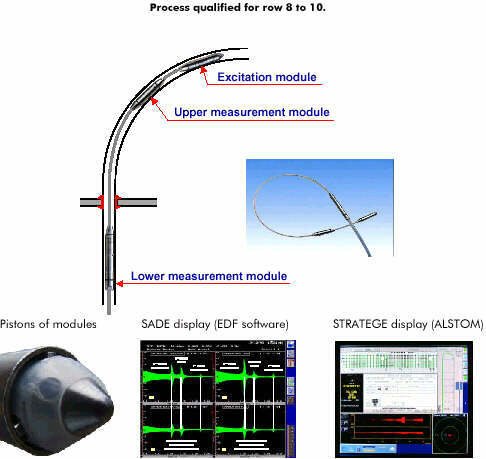 STACOUF is a software developed by EDF for the processing and analysis of bobbin coil data issued from several inspection lines running in parallel. ALSTOM integrates STACOUF into its data acquisition system STRATEGE. STRATEGE is a Real Time Acquisition, Processing and Management data System, working on HP 9000 UNIX. The strip chart is still used, and printed in the same time. First acquisition of helium leak testing from a shelter outside of the Reactor Building. First step of PSICHE, EDF software for analysis of LT data. First test of STRATEGE on site, coupled with the new EC8800 Eddy Current unit designed by ALSTOM. From the shelter, STRATEGE acquires digitized ET data, then checks their quality, and, if OK, processes and stores them on DON during data acquisition of the following tube. Connected with the software which pilots the SMOR manipulator, STRATEGE offers sequences of automatic data acquisition allowing an acquisition rate of about 20 tubes per hour in bobbin coil configuration. ALSTOM decides to continue in this way and develops STARLYSE, which integrates the control command of the finger-walker, STL and SAX push-puller. STRATEGE becomes the supervisor of the equipment ; it is in charge of the inspection plans, setting of the EC unit, movements of the finger-walker, data acquisitions cycles, data quality check, automatic data processing and data storage on DON. LT : Instrumentation of the secondary side of the SG (measure of the relative humidity, helium concentration, pressure, dry temperature and primary sweeping flow). Inspection of the U-Bend of row 1 to 3 using an ET flexible rotating probe. STS process improvement and integration in STARLYSE. Inspection of tube zones situated under the SG 900 MWe support plates, using an ET rotating probe. S10 process improvement and integration in STARLYSE. LT : implementation of bracing and drying system on secondary side of the SG. First use on site of PSICHE for overseeing acquisition and data analysis. SURCOUF offers an automatic data processing which allows the suppression of the strip chart still required for bobbin coil inspection. The SURCOUF automatic data processing are implemented into STARLYSE and are executed in real time during the data acquisition. The strip chart is suppressed without causing an excess load of work for the analysts. STARLYSE is generalized to all the ET SG inspections. The DON support is replaced by the Magnetic Optical Disk (DMO). After implementation of the FRAMATOME manipulator ARAMIS control command in STARLYSE, ALSTOM performs three inspections in partnership with FRAMATOME ; ARAMIS is used for SAX, STL and STS inspection. After implementation of the ZETEC manipulator SM22 control command in STARLYSE, ALSTOM performs an inspection using a bobbin coil on a replacement SG positioned horizontally. LT: preparation of the secondary side of the SG during ET inspections, the leak testing doesn't impact on the duration of the SG NDT activity. Instead of the strip chart, PSICHE is used for calculation of leak. measurement of the leak position in the tubes by aspiration tube per tube. Inspection of the U-Bend of rows > 3 using an ET flexible rotating probe. STG process improvement and integration in STARLYSE. Development and beginning of use of data analysers for SAX and STG inspections, operating under Windows NT and including EDF know how using existing libraries. Implementation of Helium Leak Test in STARLYSE, and measurement of the height of leaks with a massic flow reducer. Inspections of the tubes of row 7 to 9 of the SG 900 MWe using a Supple Vibrating Probe. Industrialization of the SVS probe, development of the process and implementation in STARLYSE. Integration of the data analysis sofware and the management database system working on Windows NT server, increasing the analysis team productivity during inspection phases. See numbers of tubes inspected by year in the various kind of inspection (figure 1 and 2), evolution curves of acquisition rate and time required to summarise results (figure 3 and 4). Today, a 100 % tube sheet inspection requires 120 hours with bobbin coil SAX, 60 hours with rotating probe STL and 12 hours in Helium LT.
SG NDT market represents today an important part of the global French NDT market ; ALSTOM part evolves between 34 and 37 % and the requirements of the principal EDF dictates the evolution of means. If the automation of data acquisition and analysis reached a satisfying level, the operational organization can still and have to evolve ; suppression of the repetitive tasks, like media manipulation or paper sheets analysis, will be a way of change. New data acquisition system, working through high flow network and including equipment administered by a supervisor. A simple human to machine interface allows to command several inspection lines by a single operator. Each equipment of the system is designed to offer the possibility to work using two probes simultaneously. Transmission of the acquisition data on a server of files in charge to package and duplicate them on the analysis server, which can be local or distant.
" STL Lift " intended to replace the STL push-puller. This equipment is fixed on the finger-walker and allows an helical movement of the STL probe, in the roll zone on 60 , 95 or 150 mm running. After installation, no service for adjustment is necessary ; the various components of this new equipment have a life expectancy compatible with the inspection of the totality of the SG tubes. Tools to help in search of the causes of dysfunction and remote maintenance of the installations which will allow to increase the productivity rate of the data acquisition system. Analysis tools adapted to the remote data analysis, data storage and printing server, automatic comparison of ET signals regarding to the previous outage ; resources optimization software. Pancake coil data analysers (STL, STS, S10 and STG) operating under Windows NT and including the processing algorithms of ESTELLE EDF software under libraries. Tools for supervision on video display, allowing a real double analysis and opening the way of the suppression of the analysis on paper. From 2001, the remote analysis from ALSTOM site will be gradually organized for the nuclear sites of France. Later, the data acquisition equipment settled in the Reactor Building will be remotely commanded from Bourg de Peage too. As for remote data analysis, remote data acquisition will offer advantages in even bigger proportions. If the technology evolution allows to regularly increase the inspection productivity, (mechanization, automation, supervision), any progress in the performance of the software packages for automatic data processing requires a lot of time for conception and qualification. By taking into account, for safety reasons, that the final validation of the results of controls will always be analysis experts decisions, productivity consists in finding a balance between equipment automation of the equipment, performances of the data processing software packages and teams organization. This evolution require means in engineering, time and investments ; ALSTOM is ready to take up challenge.